Locate the prophecy within Sky Haven Temple. Gain entrance to Sky Haven Temple. Learn the secret of Alduin's Wall. From The Ratway in Riften, it is necessary to travel with Esbern back to Riverwood so he can meet with Delphine. Make your way out of the Ratway by backtracking the way you came in, avoiding or defeating the Thalmor agents and various underworld criminals you may encounter along the way. The Esbern dialogue option "Do you know the way out of here?" will cause Esbern to lead the way through the Ratway rather than follow you (however, this can be glitched). Once outside, travel back to Riverwood and into the Sleeping Giant Inn. Upon arriving at the inn, you will be greeted by Delphine, who is surprised to see Esbern alive. After a brief reunion between the two former Blades, Delphine will wish to speak to the two of you in private. Delphine will lead you to the secret cellar, where Esbern announces that his intention is to find an ancient Blades prophecy. He will go on to say the group must leave for Sky Haven Temple, a Blades headquarters built up around an ancient Akaviri military camp in the Reach. Of particular importance within that location is a structure from the First Era known as Alduin's Wall, which may tell how to defeat Alduin. Delphine soon realizes that Esbern's description of the temple's location matches her knowledge of the Karthspire, and the Blades agree to set out for that location. Delphine tells Orgnar that the Inn is now his and bids him farewell. At this point, you can choose to either travel with the Blades or alone, heading towards the marker Delphine placed on your map. If you choose to travel alone, it may be easier to take a carriage to Markarth and then head east, as Delphine recommends. You can also take the longer route through Falkreath Hold, though this is generally easier if you have the Blades with you. Whether you went as a group or solo, when you arrive at the Karthspire Camp you will find yourself up against a horde of Forsworn, and possibly a hagraven. Both Delphine and Esbern will arrive and assist you. Though you can stand and fight, if the battle begins to overwhelm you, it is simple to retreat into the Karthspire caverns themselves (but see the Bugs section). You will now need to journey through the interior of the Karthspire, defeating the three Forsworn, including a Forsworn Briarheart, and making your way to the beginning of the Akaviri ruins. Heading up the stone steps on the right you will be confronted with a trio of three-sided pillars, each side inscribed with a symbol. According to Esbern, they are of Akaviri origin, but the one that matters most to you is the symbol meaning 'Dragonborn'. This symbol resembles two dragon heads facing each other and an arrow pointing down. Activate all three pillars until this symbol is facing you. This will lower the bridge to your left, allowing you and the Blades to continue. In the next chamber you will be confronted with a floor of pressure plates, inscribed with the same three symbols as the pillars. Once again the Dragonborn symbol is the key; stepping only on these tiles to reach the other side. Stepping off of the route will cause a fireball to be launched, so moving slowly is advisable. If you prefer, you can use the Whirlwind Sprint shout to move across without triggering the trap. Once safely on the other side, pull the chain to allow the Blades to cross, and exit the chamber. You will need to travel across a pair of bridges, and then into the entrance chamber of Sky Haven Temple. Esbern heads for a large stone head built into the far wall, which, according to Esbern, is the visage of Reman Cyrodiil. In fact, the entire temple is some sort of shrine to him. In front of the head is a large carved circle, which Esbern declares to be a "blood seal", requiring the blood of a Dragonborn to function. Activating the circle prompts you to cut your hand, dripping blood on the circle. The stone head then retracts, and an opening is revealed. Delphine and Esbern take a few moments in the following tunnel to inspect the Akaviri carvings and light the braziers, but you may wish to run ahead and view the temple proper. Upon arriving, Esbern is immediately attracted to a large relief on the far wall, Alduin's Wall. He moves over to inspect it, taking several moments to fully identify it. 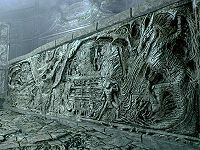 The wall depicts the history of Alduin and the Dragon Cult, and details a prophecy regarding their defeat. Ultimately, he proclaims that the ancient Nords actually used a shout to defeat Alduin, and Delphine turns to you asking if you know of such a shout. At this point, your best source of information is likely the Greybeards, however much Delphine may dislike them. Esbern will go on to explain that the last panel speaks of Alduin's return and his contending with the last Dragonborn at the end of time. From here, take a moment to explore the Temple to locate the leveled sword Dragonbane found in a room almost straight opposite Alduin's Wall. Bid farewell to the two Blades, both of them enraptured by Sky Haven Temple, and leave the building. Your next destination is High Hrothgar, home of the Greybeards. If you choose to travel with Delphine and Esbern, they may stop following you for no apparent reason. However, simply continue to Sky Haven Temple without them and they'll meet up with you eventually. If you leave them behind somewhere to complete other quests, you will again encounter them after crossing the pressure plate puzzle. You may also tell Delphine to stop following you and next to follow you again; this will make both of them follow you again. One trigger for Esbern and Delphine to abandon you is that your party enters into combat along the road. This is particularly likely at the Forsworn camp near the entrance to the Karthspire. Another trigger point may also be passing through Helgen. To avoid this, make sure you keep Delphine and Esbern close by as you approach the gates. Delphine will say "We'll meet you at Karthspire". Simply approach one of them before they start running off and tell them to wait there, then tell them to follow you again. If you meet Esbern and Delphine at Karthspire and choose not to complete the mission just yet, they can follow you as companions. They are high level and immortal companions; you may still have a normal follower along with them. However, Esbern and Delphine will constantly tell you to take them to the quest destination, and Esbern has a fondness for area-effect spells and may get into fights with other followers. The Sneak perk Light Foot does not affect the pressure plates in Sky Haven Temple. The temple contains a full set of Blades armor (heavy armor), six Blades swords (semi-unique one-handed swords) found in the same room with Dragonbane. Take note that Dragonbane is leveled when you first enter Sky Haven Temple; thus the quest should be left until you are level 46 if you want the best version of the weapon. The room also contains a copy of the one-handed skill book Mace Etiquette. It is possible to encounter an Elder Dragon or an even stronger form at Karthspire even if you do not have the appropriate level for them to spawn anywhere else. A tripwire in The Ratway Vaults may reset and block your way out. Use Unrelenting Force through Esbern to activate the trap. Esbern may get stuck in the book animation at the beginning of the quest. Running into him or hitting him with Unrelenting Force may fix this. setstage MQ203 60 can be used as a partial solution for this and will advance the quest to stage 60 ("Gain entrance to Sky Haven Temple"). If Esbern is leading you out of the Ratway, he may freeze in the large central room due to a pathfinding loop. ? This is apparently recoverable only by loading an earlier save. If you have already explored the temple entrance and lowered the bridge when this quest is started, the quest might get stuck. After activating the Blood Seal, instead of following you into the Temple, Delphine and Esbern will run back to the first puzzle and wait for you to complete it; however, it has already been completed, thus making the NPCs wait indefinitely. Open the command console and type setstage MQ203 140. This will get the NPCs to move across the bridge. It is also possible to use the moveto player function to move both of them to your location once you're at the top. If the above still doesn't work, open the console and type setstage MQ203 280. This finishes the quest for you and starts the next one. The position of Delphine and Esbern when you enter Sky Haven Temple appears to matter when this bug is encountered. Basically, both Delphine and Esbern must be past the area previously closed off by the face when you advance into Sky Haven Temple. To achieve this, load a saved file (or auto-save) before activation of the Blood Seal. Once you activate the Blood Seal, while Esbern talks and you are able to move after activating the Blood Seal, immediately "equip" the three-word version of Unrelenting Force and move directly next to either Delphine or Esbern looking at the now opened entrance. Both Delphine and Esbern can be "shouted" into the entrance area, will not attack when shouted, and will follow you into Sky Haven Temple advancing the quest. If the "shout method" above doesn't work, use this workaround: Just before the three of you leave the Inn at Riverwood, choose the option to travel together. Go outside, and then fast travel directly to Sky Haven Temple. You will land outside the skull entrance along with the two of them. Let them go through the motions, and then slice your hand when the time comes. Once the door opens, let them go through their dialogue sequence. Walk first up the stairs—and they will follow you. Esbern and Delphine may get stuck in combat mode if you do not kill all of the Forsworn at Karthspire Camp. If you wait for a long time (10+ hours), this may reset their stance and they will continue up the stairs, however it does not appear to work every time. Instead of waiting, leaving the cave with Sky Haven Temple and then fast traveling back to Sky Haven Temple also should continue the quest. Killing all of the Forsworn before entering Sky Haven Temple should avoid this entirely. Esbern may not complete examination of Alduin's Wall. If you have a follower with you when you enter the interior of the Karthspire, they will not follow you, but they may reappear when you enter Sky Haven Temple proper. If this happens, Delphine may fail to follow Esbern up the steps or engage Esbern in dialog, preventing the quest from completing. Reloading a save and telling your follower to wait outside Karthspire or simply go home should avoid this. 280 Finishes quest I found the Blades loremaster Esbern and brought him to Riverwood to talk to Delphine. He believed that the secret to defeating Alduin would be revealed by Alduin's Wall, an artifact created by the ancient Blades. We went to the hidden Blades stronghold of Sky Haven Temple, and found Alduin's Wall inside. It showed that Alduin was defeated in the past by some kind of Shout. The following empty quest stages were omitted from the table: 0, 1, 5, 6, 20, 25, 30, 40, 48, 65, 70, 75, 80, 100, 110, 120, 140, 150, 180, 185, 210, 230, 250, 260, 290, 300. On the PC, it is possible to use the console to advance through the quest by entering setstage MQ203 stage, where stage is the number of the stage you wish to complete. It is not possible to un-complete (i.e. go back) quest stages, but it is possible to clear all stages of the quest using resetquest MQ203. This page was last modified on 27 August 2018, at 01:21.